Many thanks to the kids, librarians and teachers who were kind enough to share their opinions. I am so grateful. Kelly Milner Halls is a captivating storyteller! Her curiosity and enthusiasm for what she does is contagious. She exudes warmth and genuine love for children and their interests. Kelly is simply amazing to see in action!! You are the best author presenter our school’s ever had!!! My students absolutely love Kelly’s Curiosities. All my classes watched the videos when we getting ready for her visit (Doll Island! Creepy!). The visit was fantastic! Lots of fun and really amazing stories! I was especially pleased to see that Kelly tailored her presentation for all of our grade levels so every student was entertained. It was amazing to see students enthralled with Kelly’s fascinating stories. Many of my coworkers reached out to let me know how impressed they were with Kelly. Kelly also took the time to respond to all of the emails sent by students in the days after her visit. Kelly really is a natural with kids and I would give her my highest recommendation to any educator looking for a great author visit! We were so lucky to have Kelly visit our school this year! Kelly was able to do a different presentation for each of our grade levels K-5. She had everyone engaged and excited from Kindergarten to 5th graders, to our Focus classroom students! The kids LOVED her! She captured their attention for the entire period and could easily have gone on longer had our schedule allowed it. She definitely created some new fans and inspired our students to explore their curiosity! Teachers and parents were also thoroughly impressed with Kelly’s presentations. She is a crowd pleaser! You will not go wrong inviting this engaging non-fiction writer to your school. Everyone has been raving about you and how you connect with children. We loved having you! I’ve printed these pictures to include on our pig out board and in the slide show, and forwarded them to the appropriate teachers. You have a knack for connecting with the children who need extra cheerleading and celebrations. The egg that you posted on your website was my student who is in the resource room, she was beaming all day long because you chose her egg, and the picture of the child before lunch is a child who needs lots of extra support as well. It warms my heart to see that you can sense this and give them some extra attention. Thank you! I have never heard so many outstanding reviews following an author visit!!! Lots of teachers have been coming over to say that it was the BEST author visit ever. Lots of students have been coming over in hopes of checking out a book by the author. They absolutely loved the visit. 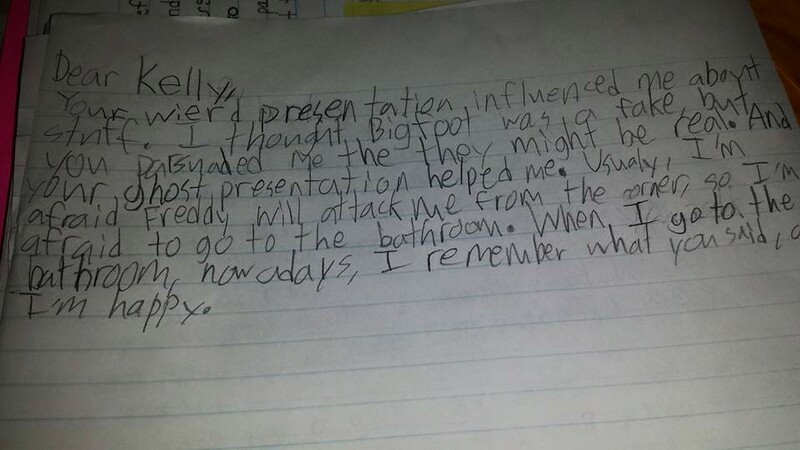 Kelly knew just how to engage the students and capture their imaginations. I can't believe how kind she was and how incredibly generous with her time. I HIGHLY recommend her to any other schools. Thank you so much for today. My students and staff loved meeting you and hearing you speak. 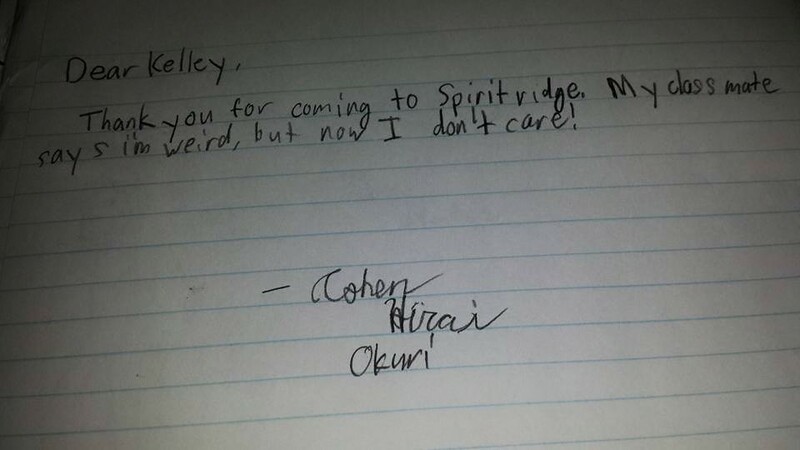 Notes from teachers are coming in and one teacher said she overheard a student say, “Can she stay and talk through lunch? I want to learn more!” Not every day you hear that! Thank you for your time and enthusiasm for questioning. I loved when you said, “the questions are just as important as the answers.” I hope that will encourage our students to keep on questioning and finding new answers. I wanted to thank you again for spending the day with us at Maple. Our students truly enjoyed your presentation and especially the extra attention and personal stories you shared with them in the classroom Q & A sessions. Your visit was engaging and so memorable. I wanted to pass along a few emails I received from parents and others who were also impressed with your work. Good luck with the new book and we would love to have you back at Maple in the future. Oh my gosh. As soon as I walked in the door Maia said, "Mom, ask me what I did at school today." So I did. Her response was, "I touched dinosaur poop!" That was the beginning of a 45 minutes of recounting the Young Authors event with Kelly Milner Halls. I learned about Gigantor. I learned about how Kelly likes that she is weird. I understand that she writes crazy non-fiction and Elle wants to write the same. My girls took me through her website and begged me to email her because they had more questions. There was so much more the girls expressed with such excitement and engagement. Thank you for bringing Young Authors to our school and finding great talent. This was an impactful and memorable day! We heard much the same from Desmond! He told us about the ghost stories she talked about and her book about aliens; which he really wants. Also, he showed us her autograph and with a glint in his eye, referred to her as 'Kelly'. He said she told them to call her 'Kelly' because she wasn't their teacher or anything. He was really taken with her and her stories. Thank you!! I, too, was impressed with Kelly's presence and the way she was able to engage the students. She truly had a captive audience. Thank you all for bringing her to Maple! "She had a great sense of humor, and I'l love to hear about the other books she has, ESPECIALLY the ghost books. Awesome! Just 30 minutes, and she's my favorite author. Great personality!" "I thought she was a weird but cool person to talk to. Like a crazy grandmother." "She was strange, interesting. I like the way she looked at things she see's the glass half full, rather than half empty." "I think she was a funny and inspiring person. I wish I could have listened to her longer got to personally meet her." "I had just come from the Warrensburg lit. fest. and to be honest, I wasn't really looking forward to listening to another long speech about how the peep got inspired & how long it took them to make a book. Wow! She was hilarious. Never cracked up so much at a school presentation. I liked her approach to her speech...instead of the steps to write a books and a bunch of childhood background, we got funny...& informative tales of why she started books and how she came up with the contents. I guess more importantly, she had a fantastic attitude and personality that entranced her audience. Thank you very much for coming!" Kelly Milner Halls came and visited our school, Lewis & Clark Elementary in November, 2013. What a fabulous visit! Her presentation lined up perfectly with our current focus of “Genius Hour” in which the kids find something in which they are passionate and research to learn more about it. Her books are very high interest and with her energy and enthusiasm the kids were completely engaged in what she was sharing from the opening question to the very last answer. We heard from teachers and parents how much that the kids enjoyed and benefitted from the visit. Thank you Kelly Milner Halls for inspiring us, enlightening us and making us a little more filled with wonder. Kelly Milner Halls visited our school, Adobe Bluffs Elementary, in February 2013. We would definitely recommend having Kelly Milner Halls as a visiting author. Our school has been hosting authors since 1997 and Ms. Halls was one of the best! Kelly’s presentations are a lot like her personality and her books - informative, entertaining, interesting and fun! Her presentations were well thought out and tailored so that students in all grade levels, pre-school through 5th grade, were completely engaged. Kelly inspired students to write, to explore, to be different, to ask questions and to think! After each presentation, she encouraged students to take photos and touch the amazing displays. She was very approachable and happy to meet each student, answer questions and autograph books. It was not easy to find an author who appealed to all ages and met the criteria of our teachers and parents, but Kelly was the perfect solution. Preparations for Kelly’s visit were very easy and straightforward as she was incredibly responsive, accommodating and flexible about all the arrangements we made. Our students, teachers and parents were extremely happy with Ms. Halls and are still talking about how enjoyable the Author’s Faire was. Our school feels as if they now have a good friend in Ms Halls, and there is no doubt that she will be requested again for future events! Kelly Milner Halls visited our school (a grade 5-6 intermediate school of 580 students) in the spring of 2012. There are few words to describe how awesome this visit was and I am sure I will never capture the true essence of what her visit to RCI meant to our school community. As the school library media specialist I have hosted authors at my school for the past nine years. While we have had some great authors there has always been a marked difference in the opinions between the teachers and the students. In other words, authors the teachers loved somehow just didn’t muster up to what the kids wanted to hear and the authors the kids loved just didn’t fit the expectations of the teaching staff (and didn’t seem to be worth the fees paid to them). Kelly, on the other hand, was the FIRST author to pass the test with flying colors on both counts. Kelly’s presentation was totally engaging to the students. Her topics of choice speak for themselves, but when she talks about researching and writing about mummies, UFO’s, Bigfoot and the like she already has a head start in peaking the interest of even the most reluctant of readers/writers. Kelly’s passion for her topics is so evident in her presentation the students literally are hanging on each and every word (and laughing along the way). 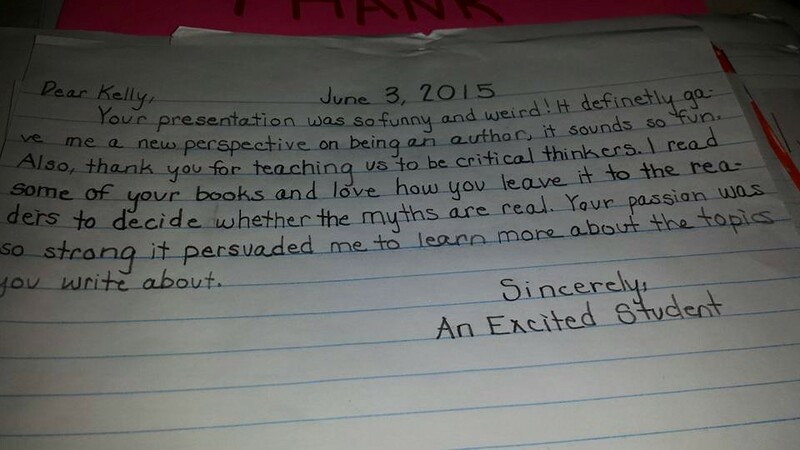 The entire staff, whom enjoyed her presentation equally as much, gave her high marks for inspiring the students to be good critical thinkers, good researchers and giving them a reason to WANT TO WRITE! She gave every student the message that they too can be a writer and have fun doing it. Outside of the presentations Kelly was equally as excited about meeting individual students as they were to meet her. This is not always the case with other visiting authors and I commend Kelly in her enthusiasm to talk to and visit with as many students as possible. She was tireless in her willingness to answer one more question, to meet one more inspired student, to sign one more autograph…and the list goes on. Logistically speaking Kelly was also one of the easiest authors to host and I can say I have made a life long friend in having met her. Kelly’s willingness to keep her fees low enough for schools to afford her visits and her flexibility in scheduling presentations at the school speaks volumes to her priorities. She is a pleasure to be around and makes planning an event like this as easy as it gets. The only problem with having Kelly visit is in trying to figure out how to get her back again as soon as possible! Please do not miss out on the wonderful opportunity to inspire the young minds at your school. Turn them onto the world of non-fiction in a way that no one else possibly can by inviting Kelly to your school. You won’t be sorry. We owe you a thousand thanks! You are far and away the most gracious, generous, and grounded visiting author that has ever come to our school. I think Lit. Connection could look for a LONG time and not find someone of your caliber. I wanted to share with you my experience with Kelly Milner Halls, who came to visit my elementary school (K - 5) two years ago. Kelly gave an exuberant presentation that had students and teachers fully focused on what she told them about her experiences becoming a writer and as a writer of nonfiction. She engaged students with her presentation so much that students did not want to leave... nor did teachers! Kelly also gave writers’ workshops during her day with us, and our fifth grade students learned so much from her. She showed them her editor’s red ink notes on her (at the time) new book that she was working on, reminding students that editing is an important part of writing. She answered many questions from my students about the writing process and did it in student-friendly language. My students were clearly disappointed when it was time for Kelly to move on to the next writer’s workshop as they still had many questions they wanted to ask her. I’ve hosted many authors over the years, but Kelly was the first one that was so well-loved students acted like she was a rock star when they saw her in the hallways! Her message about writing had clearly made an impression. I highly recommend Kelly Milner Halls for an author visit with your students! We were fortunate to have author Kelly Milner Halls visit our school in 2010. Kelly gave three presentations to our 6th grade students. She also had lunch with a few lucky contest winners and stayed at the end of the day to meet any students who did not get into her presentation. Kelly’s presentation was mesmerizing. The students were totally under her spell. Kelly spoke about her research into cryptids, showed some amazing slides and had some great props. The students loved looking at the cast of a bigfoot footprint. The dinosaur fossils were a real hit as well. And who could ever forget the students’ surprise at the dinosaur poop! Students have been begging me to bring Kelly back for another visit. Many of them have written stories about cryptids and I can’t keep any of the books on the shelves. Teachers have also been very positive. One teacher who has never spoken about author visits in the past told me this was the best visit ever! I am the librarian of a Kindergarten through Grade 6 campus in the Houston, TX area. I have had privilege of hosting Kelly several times in the past six years. Most recently, I was able to have her speak to my older students when her book, Tales of the Cryptids, was on the Texas Lonestar list. She is an engaging, energetic speaker and the kids adore her. Most authors available for speaking engagements at the K-6 level are fiction authors. Kelly’s focus of non-fiction is a huge benefit. With the challenge of high stakes testing, the need to engage our students in non-fiction reading is more important than ever. After having a visit from Kelly, I see a huge spike in circulation of not only her books but other non-fiction titles as well. In addition, she has always been very flexible in working with me so that all of my students can enjoy her presentation. I can not recommend her highly enough. I would highly recommend Kelly for an author visit to your school. Kelly visited our school about a year and a half ago and we will someday have her back again. The students and teachers all loved her! She keeps the students captivated with her information on Bigfoot and all of her hands on things she brings for the students to look at and touch. Kelly is so personable and friendly with the students and staff, you feel like you have known her a long time. The kids also love her books and are in high demand all the time. I met Kelly Milner-Halls two years ago a in Wisconsin at the WSRA convention. After hearing her speak to teachers and seeing her with student groups I would heartily endorse her as an author/presenter for fifth and sixth graders. I've coordinated the author/illustrator visits at my elementary school for more than a decade, encompassing more than twenty presenters and programs from the world of children's literature. We did not yet have an opportunity to include Kelly in that line-up, but will hope to do so as funds become available again. Kelly's personable, student-focused, and entertaining approach mesmerized and intrigued everyone in her sessions. I feature her titles in the workshops I conduct for teachers and librarians on using picture books with older readers to improve engagement, comprehension, and content development/extension. If you have the opportunity to have her visit and work with your students I urge you to pursue it. 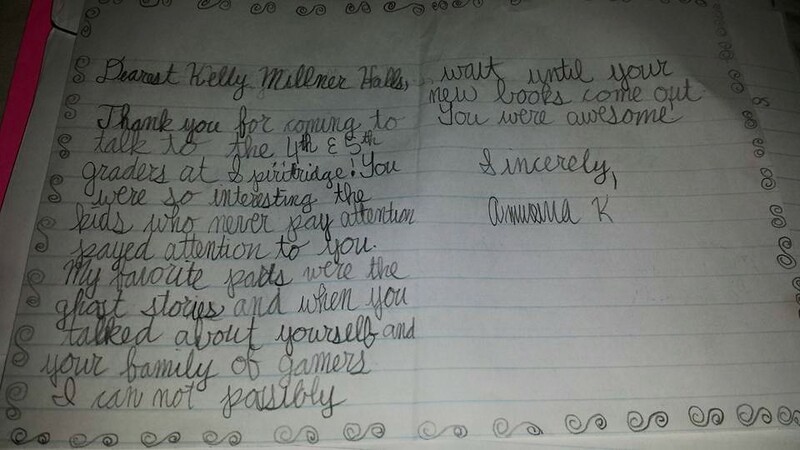 Kelly Milner Halls visited our 5th grade classes last year to speak about her writing process. From the first minutes of introducing her, she had the kids on the edges of their seats, fully engaged in her stories about how she researches her books. She brought great props, including real dinosaur fossils, a cast of a Bigfoot footprint, and art from her books, but mostly it was her entertaining stories that kept the kids rapt, especially those of her field research and interviewing experts about her upcoming books about Sasquatch and UFOs. She was easy going and accessible, addressing the curriculum points about writing nonfiction (doing good research, crediting sources, telling a story and not just listing facts, etc.) and answering questions from the students. She really was brilliant and the books of hers that we have in our library remained checked out for the rest of the year. Several children mentioned her visit as a highlight of their year when they did year-end recollections. We'd love to have her visit again. Kelly Milner Halls came to visit our elementary school and was a huge hit among the student body and faculty. Her presentations are incredible! She brought reproductions and relics that she actually passed around for kids to hold and examine. I've planned numerous author visits and Kelly's was by far the most informative, interactive, and student friendly. Can't wait to have her again, someday. Students, parents and staff always have a blast with Kelly Milner Halls. I have seen her give presentations to a total of 1,000 children at three schools since 2002. Students were engaged and giggling at every presentation, no matter which book Kelly was sharing. They were in awe as she described stories connected to Tales of the Cryptids and Albino Animals. Unlike some popular authors, Kelly is humble, kid-friendly and goofy. Every library teacher in the Central Valley School District (Spokane, WA) reported that Kelly was very easy to work with and that she charged extremely reasonable fees for school visits. “Awesome!” is the word my students used to describe Kelly’s presentations at Lee Elementary School. Students, staff and parents loved her enthusiasm, kid-friendly speech, awesome artifacts (which kids are allowed to touch!) and positive personality. Many kids asked me the next day if she could come back again this year. Kelly bends over backwards to accommodate student needs, adjusting to times of day, ability and grade levels, and staff requests. She is informative and great fun. I would highly recommend her for any school.